This simple and easy to make centrepiece will be sure to have your Easter guests hopping with excitement! Prepare the jellies following packet instructions. Pour jelly mixture into a 16cm x 26cm baking pan. Refrigerate until set. Spoon half of the jelly into the bases of 6 tall serving glasses. 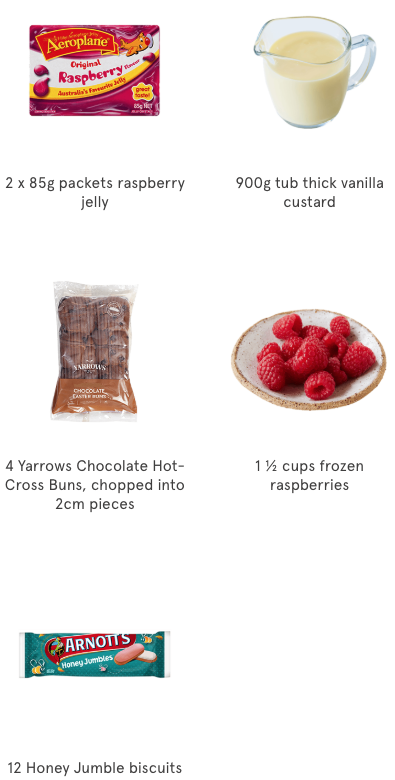 Top with a layer of custard, a layer of chopped hot-cross buns and then the raspberries. Repeat layering using the custard, hot-cross buns and jelly. Top with a dollop of custard. Decorate each trifle with 2 honey-jumble biscuits (bunny ears style) and serve.